Successfully Added Dash Cam & GPS Navigation Mirror - Full HD Dash Cam, HD Parking Cam, Android Interface, Glonav GPS, 6.8 Inch Touchscreen to your Shopping Cart. Make your car smart with this Android dash cam and GPS, featuring full HD recording, a large 6.8-inch display, and a rearview parking camera. The high-tech accessory to make driving easier than ever. The dash camera on this rear view car navigation mirror and DVR boasts a 1/4 inch CMOS capable of capturing the world in spectacular 1920 x1080 definition. Recording at 30FPS means no detail is missed and with a 170-degree viewing angle it will capture all the important data of every incident on the road. The perfect protection that will make any overzealous cops and insurance scam artist think twice before picking on you. Memories can play tricks on us or fail us in times of stress but this car dash cam brings an undisputable record of events to back you up when it matters most. Many courts and insurance companies now recognize dash cam footage as concrete proof and as such this level of protection can lower you insurance premiums as well as protect your rights. Getting around on the overcrowded roads can be trouble enough without having to read a map or navigate to your desired destination. Take the stress out of route finding with rearview navigation mirror. A large 6.8 inch HD touchscreen clearly displays the route you need to take and positioned in a prominent position on your review mirror it is easy to see without taking your eyes off the road. With a Glonav GNS7560ET/N1 chip, the GPS can pinpoint your location with great accuracy, with voice support you will be guided to your destination by audio instructions ensuring no turn is missed. Reverse and parallel parking can be the bane of many drivers life but fortunately, help is at hand. No more blind spots, looking over your shoulder or craning your neck to get parked. The parking camera in this kit will bring a clear view direct to your mirror and with a 6.8-inch screen you can glide into any parking spot without difficulties. A safer, quicker and easy way to park you will wonder how you ever managed without it. There is PIP (Picture in Picture) support so you can keep an eye on the navigation while showing the camera feed. With the FM transmission, you can play music from this rearview mirror kit and tune in your car stereo to play that music through your car's speakers. 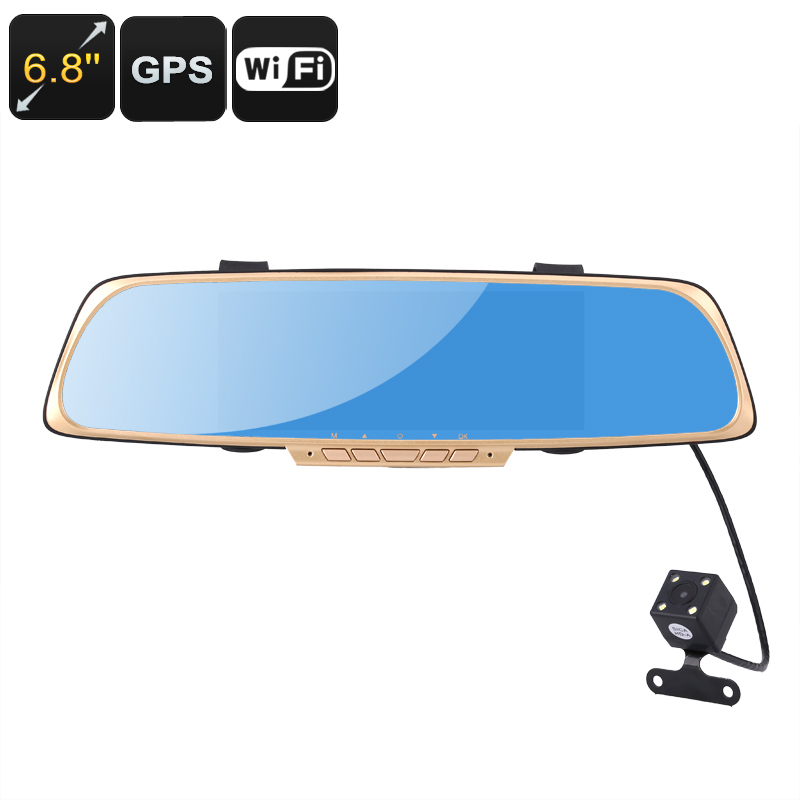 The Android GPS navigation mirror + dash cam comes with 12 months warranty, brought to you by the leader in car electronic devices as well as wholesale dash cams and navigation units..